One of the key elements that go a long way to strengthen your business online is the design of your website. And attractive backgrounds and clipart play no less a part in improving it. With Mother's Day around the corner, you might be probably looking for some captivating backgrounds, graphics, banners and dividers related to the occasion for your website? If yes, your search ends here. 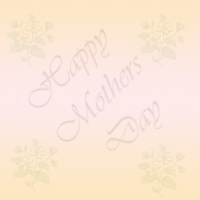 Scroll down and have a look at our splendid collection of backgrounds, graphics, banners and dividers for Mother's Day. Adorn your website with all these attractive little pieces from TheHolidaySpot. If you choose to use any of the images below on your site, then please give the credits to TheHolidaySpot.com. And for those who personally want to customise Mother’s Day card for their beloved mother’s, using these clip-arts wouldn’t be a bad idea. You can simply click on these clip-arts and take a print of it and paste it on your hand made cards. These decorated cards are sure to enthral your mothers to the fullest. Tip: To use the clipart on your website, click on any of the thumbnail images you like and right click> save as picture on the expanded image on a new window. Alternately, you may right click on any of the thumbnails and choose "Save Target As". No direct linking should be done. To take out a print, click on any of the thumbnail images to expand it on a new window. Then click File>Print.